These are a brand new unique illustrated set. Story stones have long been used in history for story telling and their magic and charm is still as strong as ever. Used in a classroom or at home, story stones ignite the imagination, helps encourage creativity and language. Simply take a stone from the bag and use that picture to start telling the story, pick another stone and include that element in the next part of the adventure! Bringing story telling to a whole new world, Story Stones are a great way to encourage imagination, creativity and language. 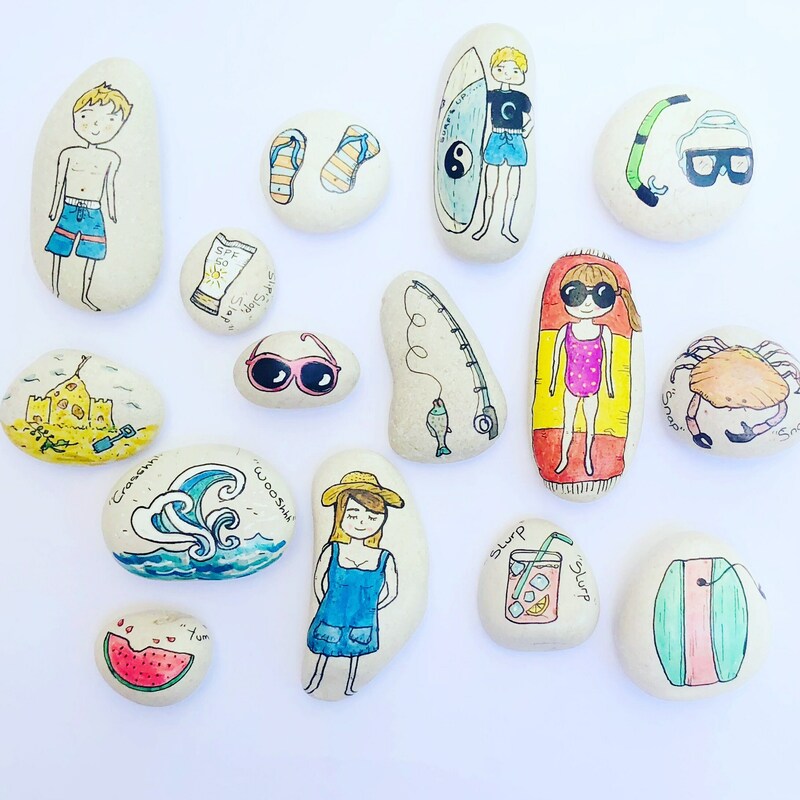 Working with your child or letting them get creative on their own, pick a stone from the bag and let the adventure begin. Start the story and pick another stone to add a twist, another character another obstacle or just more fun. No two stories will be the same. Each stone is hand designed and painted using non toxic materials. No two bags are identical. There are 15 stones to a set and they come in a drawstring bag for easy storage. When I first found out about story stones I immediately fell in love with them, I wanted them and wanted to find out more! The thing that attracted me was their simplicity and rawness yet they were capable of telling a thousand detailed & complex adventures! I set out on many of my own adventures with my two children in tow, searching for pebbles on the beach, excited to return hope and get creative. The stones soon became popular with my friends, and then their friends and so on! My stones have made their way into pre-schools and family day care and I hope they make it to your home to. We ship all our items with Australia Post. Within Australia: Regular parcel post is used. You can select express post for an additional charge. UK, USA and NZ: International Track and Trace is used. Please refer to http://auspost.com.au/parcels-mail/pack-and-track-international.html for further information about this service. All other countries: Standard Air Mail is used. At this stage, no track and trace option is available. If for any reason you are not happy with your product, please contact us immediately as we are more than happy to replace or refund your order. If your parcel has not arrived within a reasonable timescale, please contact us so we can launch an investigation with the postal system. All unresolved investigations will be refunded or resent.